This is the first in a series of accounts of occasions on which I have been forced to confront my own mortality, sometimes at an uncomfortably close distance. It is dedicated to you, if you have ever been there at the precise moment that someone really needed you. I strain to recall now what it was that brought me specifically to Beni Mellal, a Moroccan city known as a centre of agricultural trade, but if it was another unforgettable travel experience that I was seeking, then, in that respect at least, that is very much what I got. I know I was in the general area because I had resolved to go off the beaten path, as usual, and take one of the colorful local bus services to get from Marrakech to my next destination, the great Islamic jewel of Fez. The only way to enjoy travel in Morocco was, at least back then, to endeavor to exercise endless patience with people and maintain quite a bit of physical endurance for good measure. Without the physical element of endurance, patience is nigh on impossible, as any parent of a tired child will attest. Even with the fitness element solved, being set upon at every turn and being followed from everywhere any transportation stopped by a mob of young, multi-lingual, silver-tongued men could either drive you to act out, or at least make detailed plans to act out, some of your most violent fantasies, or it could invite you to define the spirit of true adventure, where choosing a path meant surrendering your time and likely your money to someone who you hoped you could trust but knew you probably couldn't. 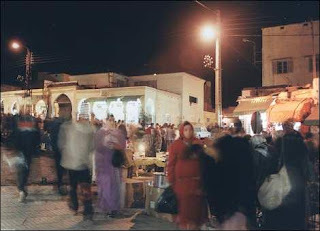 To that end, I do remember the bus pulling into the centre of Beni Mellal sometime during the late afternoon, and being surprised at the lack of willing "guides" that usually waited like mosquitoes in the squares of most of the major Moroccan towns through which I had passed. The other must-have for travel in Morocco was a companion. I was the ultimate lone wolf, with the view that I always got into much more interesting situations when there was noone around to tell me how stupid I was, but, as unexplained forces would have it, I was to have another lost soul to accompany me on this particular adventure. His English name was Eric, he was from Hong Kong, and he spoke almost no English, and absolutely no French. From a purely utilitarian point of view, my value to him was obvious; I could get by in French. When I met him, I could have had no idea that his acquaintance would turn out to be infinitely more valuable to me. The moment we stepped off the bus, it became apparent that I was probably the only pale-faced foreigner in town and Eric was certainly the only Asian, as our trailing, intently curious, and continually growing entourage proved. My guide book devoted only a single sentence to the area, listing a single hotel, and my French was adequate enough to learn within minutes after my arrival that that had long since closed down. We were thereby placed in a situation that even a mildly adventurous traveller knows well; needing to retreat into our own physical and mental space in order to make a decision, while a crowd of people shouted suggestions, advice, and orders in a dialect of a language I could only partially understand in the first place. In such situations, you want to tell everyone around you to just shut up and let you think, and in weaker moments you actually do start shouting that very thing, but you know that, in most cases, if you do, you will have an even smaller chance of getting the help you know you really could use, but are too proud to ask for. Figuring we could think better if we weren't starving, I suggested to Eric that we ruminate on the dilemma over some vittels, and we made a quick dash across the square towards the place that most looked like it might be an eating establishment. At least in this notion, my hunch proved correct, and we charged our way through the door, past the counter, and collapsed with backpacks still half-attached into a couple of chairs around a table right in the back, where we knew, based on the physics of small spaces, that only a small portion of local well-wishers could follow. Inevitably, a few of them made their way in and took places at neighbouring tables, but, as planned, most of the mob lost interest and went on their merry ways. Our steaming mint tea arrived and, for the moment at least, we found some measure of the respite we had sought. I'm asked often these days what makes me a strong negotiator, as I'm pretty well known for getting good prices on purchases and favourable outcomes from discussions. My reply almost always references the skills that I picked up in Morocco, where even a bottle of Coke has anything but a fixed price for a tourist. When you are forced to negotiate for everything, right down to the essentials of life (sustenance, shelter), you'd be foolish not to draw some positive lessons from the experience. This one particular time, however, I wish I had paid more attention to the science of microbiology than the art of the deal. It turned out that this restaurant could also accommodate guests in an adjacent inn, so I was so pleased at myself for managing to haggle a two-for-one deal on our meals to go with accommodation in a shared room that I neglected to really take into proper consideration the conditions of hygiene in the establishment. If gravity of consequences is the way to measure the quality of a decision, then that one would have easily ranked among the worst I've made in my entire life. I'm not sure what ended up being worse, the restaurant or the accommodation, but the choice of both ended up being truly regrettable. The meal itself, my meal at least, actually tasted quite good, roasted chicken and fries, and even prompted me to boast to Eric that, in being a little more adventurous with food choice, I had deftly avoided subjecting myself, for the first time in nine or ten days, to his ho-hum selection, the ubiquitous Moroccan cumin-covered kebab. But, of course, if food were just about taste, our mothers wouldn't always be telling us to eat our greens and our bodies would never pass their own judgement in all the weird and woeful ways they do. It was dark by the time we finished our meal, so we followed the toothless old fellow who we took to be our host through a couple doors in the back of the restaurant to our temporary home away from home. The room itself had two beds and a table and seemed generally acceptable, notwithstanding the dozen or so small spatterings of blood and squashed mosquitoes on the walls near the beds, so we paid the man for the room and board and waited for him to leave. Immediately after he did so, we busily began the then-customary practice of pulling off the mattresses and checking the bed frames for bedbugs. We satisfied ourselves that, if less than clean, the room was at least bedbug-free, and so we spread out a map and bus timetable and set about planning our route to Fez the following day. Shortly after finalizing those plans, I realized that it would likely be prudent to locate the washroom, as it was clearly not ensuite and experience had taught me not to wait until the moment of truth to begin such a search. Not seeing it in the hallway through which we had passed coming from the restaurant, I popped my head back into the restaurant and asked in French where I might find the facilities. The old man who had ushered us in was gone, and there were just a few men left in the restaurant, sitting around one table drinking mint tea, smoking cigarettes, and laughing. Seeing me, one of the young men got up, looking slightly annoyed, and headed through another door out the back, this one opening into an outside alley. On the other side of the alley was a door, which he rapped on harshly and, finding no reply, pulled open the door to reveal the washroom. I smiled weakly in thanks for his effort, very weakly I imagine, given the state of the little room, and tried not to gag as the wave of sharp, sickening stench from inside worked its way through my senses. The room was the size of a large shower stall, and in the dim light, it took me a few seconds to realize that that was exactly what it was. Except that it was also a toilet, apparently for public use. After almost two weeks of squat toilets, I had actually grown used to exercising my legs to do my business, but never had I seen nor imagined anything like this. 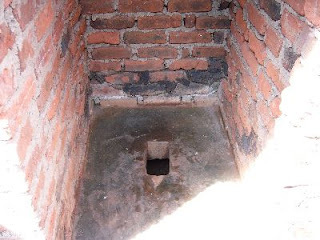 This was a squat toilet with a small sink in front of it but, to conserve space or water or both, the only way to flush it was to turn on the shower above. In fact, it wasn't really a flush toilet at all, it was a pit toilet with a pile of sewage that was getting dangerously close to the drop hole. I deduced that the opposite must have held true if you wanted to take a shower; you would have to perch precariously on the footrests while showering, praying to all that was holy that you didn't lose your footing. The worst part was that, considering I had asked about using the washroom, the young man who had escorted me was clearly waiting for me to step inside. Calculating that I could hold my breath until he vanished, I gingerly stepped in, balanced myself on the footrests, and pulled the door closed gently behind me. I could only stand being in there for perhaps twenty seconds, at which time I pushed out on the door with my backside, stepped backwards out of the toilet/shower/closet, exhaled, and re-entered the restaurant/inn, vowing all the while to do whatever business I had to do somewhere else. I shared the incident with Eric and we thanked our lucky stars that, barring a sudden onset of travellers' diarrhoea, our status as men would preclude us from ever having to use that particular facility, seeing that a wall in that same alley would be more than adequate for most of our needs. After a final cursory check through the room for creatures and critters, and possible entrance points for such, we cut the lights and flopped down on our beds for the night. The next thing I remember is bolting awake in the middle of the night with an excruciating pain searing through my gut and an imperative impulse to immediately empty my body of waste through any means or orifice available. I leapt out of bed and realized I had no choice in the world but to race to the toilet out in the alley. When I reached my destination, for at least a very brief moment, the relief I felt in the subsequent crouch and drop was equal to and perhaps greater than the complete aversion each of my physical senses had to the place. But only for a moment. That moment was followed by a revulsion of mythological proportions, as the nausea I had brought with me to this putrid little crevice in Hell's deepest chasm coalesced with the distress I now felt squatting in agonizing pain over a pit of human excrement into a succession of much longer moments that really felt like forever. But angels come in strange places, in surprising forms, and at the most opportune of times, and one certainly came to me then. As I choked and spewed and my senses pleaded for deliverance, I vaguely discerned the draft of the opening door and looked up to see my travelling companion Eric holding the most unlikely, most welcome instrument of salvation of which I could have then conceived. All hail the burning cigarette! I did not smoke at the time, but Eric seemed to know it was exactly what I needed. Taking care to avert his eyes from my squatting form, or perhaps just cringing from the stench, he handed me a lit cigarette, which I immediately and instinctively knew to hold under my nose. The hazards of second-hand smoke are by now well documented, but, in my time of need, I saw only the benefits, first and foremost of which was to replace the acrid smell of waste with a much more pleasingly acrid aroma of burning leaves. I spent most of the rest of the night in that wretched little patch of property, being fed a steady diet of burning cigarettes through a crack in the door. We also recognized the need shortly after the introduction of combustion to the equation to aerate the space regularly, as there was likely enough methane gas stewing in the air to blow us clear into the next town if it got any more concentrated, so, every couple minutes, Eric would swing the door open and closed to keep the air circulating. By the time the morning came, my legs were as badly cramped as my gut, and I was a mere shell of person, emptied of nutrition and hydration to the point of hallucination. I therefore received quite a significant shock when I returned from one of my extended visits to the place of ceaseless torment to find that Eric was not there. I was too exhausted either to panic or to notice the note he had left for me on the table, and I feel into a kind of sleep of partial awareness, knowing that it would only be a matter of minutes before I would be on the move again. However long or short it was, the next thing I knew, I was being gently shaken by Eric and persuaded to do my best to get back to my feet and steel myself for a longer journey than the one to the toilet. Eric had packed my backpack and, as he pulled me from the bed and supported most of my weight as I took the first few steps, took up my pack on his other shoulder. Where, I mumbled, could we possibly be going? I managed to decipher, through his very broken English and my very broken consciousness, that he had spent the past few early morning hours wandering through the streets of Beni Mellal, quite unable to communicate with the locals, searching for medical attention for me or, at the very least, an improvement in accommodations. He had found the latter, and he informed me that that's where we were going. Fortunately, the journey was only one of about fifteen minutes, and I remember nothing about it other than my one object of concentration, which was to avoid an orifice explosion by any means possible. I managed to do so and, thanks to what I now considered the heroic actions of my friend, we ended up in a guest house that was still far from paradise, but was in every way an oasis in this dirty, dusty part of town. That the accommodation was in a six-bed dorm room was not, upon my arrival, of the least concern to me, although my moaning would certainly prove an annoyance to the room's other inhabitants. All I cared about was whether or not the toilet flushed, and it did. I lost 25 pounds over the course of the next three days, from a frame that was already very low on body fat. For two of the three days, my system had so completely shut down all its processing functions that I could drink a glass of water and have it come out the other end, undiluted and still clear, five minutes later. After 72 hours with no food intake and negligible absorption of liquid, and without even the energy to make the 5-metre walk to the toilet without assistance, I had quite understandably given up the will to live. Had it not been for Eric sourcing a package of rehydration tablets, forcing me to consume bottles of water and clear juice, warding off the guest house's owner when he complained that none of his other guests wanted to stay in the room, and hardly leaving the room during the entire time, my parents would likely have had to go through the logistical nightmare of arranging their son's body to be shipped home in a box. Saint Eric made one other procurement that would prove invaluable, Immodium. At the first respite in the bacterial onslaught, I regained some measure of awareness, and as soon as I did, Eric insisted that I pop a few pills and get on a bus to Tangiers, from whence ran the ferry that would take us out of Morocco. I clearly needed medical help, and both of us had completely lost faith in the ability to get what I needed in Morocco, even though I can see now with the benefit of hindsight that, had we resolved to do so, we could likely have found a hospital somewhere in which I could be treated. The fact was that my illness had beaten the cultural tolerance right out of us and we just wanted to get out. In a more lucid state, I'd have likely thought to ask exactly how long a trip we were looking at, and I'd have been quite disturbed to learn that Tangiers was a 10-hour bus ride. Wanting to put the host city of my own Olympiad of Affliction behind me was a very powerful motivator, however, and I was shovelled into a seat for the long and very bumpy ride north. It was far from pleasant, and attended by much moaning, but it was without significant event that we rolled into Tangiers just after dark. Apart from deliverance from the source of my suffering, the ride did provide at least one other potential benefit; two gorgeous, very blonde German nurses, who boarded the bus in some non-descript town along the way and subsequently took enough pity on Eric and his moaning burden to volunteer to assume some responsibility for my care and comfort. Unfortunately, as with nearly everything that formed part of this whole string of ill-fated occurrences, the company of the nurses turned out also to be as much a curse as a blessing. We learned upon arrival in Tangiers that the ferry for Spain didn't leave until the following morning, so we immediately began a search for lodging, four very conspicuous and clearly disoriented foreigners wandering, after dark, through what the guidebook described as "the most dangerous city for tourists in Morocco." And so, inevitably, like the weak caribou in the herd that the wolf pack so expertly identifies, we soon attracted some very unwelcome attention from a throng of very unpleasant local delinquents. As we walked through a small, dark square, we were surrounded suddenly by a group of about a dozen young Moroccan men, who formed a half circle around us and backed us toward a wall. The two German girls had taken great pains when we set out from the bus station to cover their flowing blonde locks in makeshift hijabs, but it became immediately clear as the small mob converged around us that the covering hadn't left quite enough to the imagination of these shadow figures. One of them lunged in, grabbed in his fist a clump of fabric from the hijab of one of the nurses, and yanked it in one motion from her head, releasing a cascade of combed tresses that almost seemed to light up the night. The group of thugs gasped and then smiled greedily, no doubt each imagining that he would be the one man enough to handle this Aryan princess. They began to hiss and chortle amongst themselves, and, in a mixture of Arabic and French (when they wanted to be understood), they began to boast to each other of their plans for the rest of evening with these two beautiful ladies in tow. Suddenly, Eric cut through their jibes with a sound of focused inner fury and leapt forward to land in a fighting stance between the girls and the closest members of the street gang. As he did so, I realized in my own state of frailty and fear that the only possible way for us to prevent a very bad outcome was to somehow take control of the situation. At almost the instant Eric landed in a stance right out of a martial arts movie, I addressed the semi-circle of miscreants, in better French than I knew I had. "Do you know who this is?" I shouted. There were a few guffaws and bemused glances my way. "You don't recognize him?" I continued. "Don't you watch television?" The men looked at each other, as though looking for confirmation. "In Marrakech, everyone wanted to meet him, but you don't know who he is?" One of the smiled and made a mock kung-fu move. "Bruce Lee? ", he quipped. "Bruce Lee, kung fu!" I pretended that I had taken his response seriously, and started nodding my head vigourously in acknowledgement. 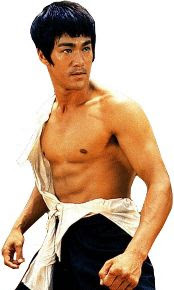 "The son of Bruce Lee!" I said excitedly. "Yes, you do know him. You've seen him on television." Eric was frozen in his fighting stance, calmly but angrily surveying the group, waiting for someone to move against him. The men looked at each other sceptically. Before their doubt could settle, I looked directly at the man who had removed the scarf from the German nurse. "And that is his girlfriend and her sister." I pointed at the girls, and continued as best I could in French. "If you say you're sorry, he may have tea with you and your friends, and tell you some stories." I knew our ruse had worked when I detected in the group's leader the scent of the sensibly proud male, where defeat cannot be acknowledged but an analysis of the situation necessitates some kind of compromise. He thoughtfully pulled two cigarettes from his pocket, put one between his lips, and then reached across a couple of his friends to offer the cigarette to Eric. Eric held his glare long enough to provide a few anxious moments of doubt, then took the offered cigarette and a light from the guy closest to him. We ended up skipping the tea, but, after Eric signed various personal artefacts of theirs with his "autograph", the group did help us in finding acceptable accommodation for the night close to where the ferry went out the following morning. By afternoon the next day, I was sitting in a hospital in Seville with a diagnosis of salmonella, an IV drip, and a prescription for Bactrim. As I look back now, Eric's face above me on my sick bed took many forms as the last swells of energy ebbed from my body during those three fateful days. Throughout these manifestations, having visited me then and since, I have come to realize that we may choose to view people who come into our lives in a couple ways. Their coming and going may indeed be entirely without any greater significance than we ourselves assign to them. Their presence at "the right time" may be explained as mere mathematical inevitability; lines will eventually intersect if there are enough lines going in enough directions. 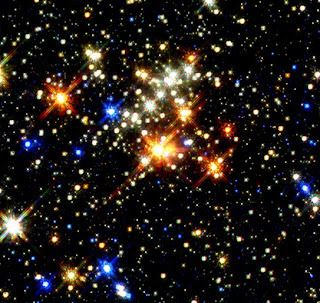 Our choice is whether to view these points of intersection like pinholes in the dark blanket of random chaos that backdrops most of our actions, or like stars that illuminate that darkness. Those people and events to whom we choose to assign such significance become a permanent part of who we are, because people will be more dear to us and events will be cherished more when sprinkled with the magical stardust of meaning. The more open we are to these interactions, the more stars we pull from the darkness to examine like sparkling gems in the light of day and drop back into the waters that fill us, the more likely it is that the interactions will start to intersect each other, like ripples from separate splashes that overlap in a lake, until they eventually form a pattern. This pattern can be seen as a random milieu of half-completed circles, or it can be seen as a work of art, fashioned with spirit but without design and possessed of great intricacy and beauty. That these patterns do not reveal themselves to everyone who deserves to see them is often cruel, for they can make even the worst of life's moments better. Even if they are merely a psychological coping mechanism, they are an extremely effective one, and they certainly beg the question of where the brain's ability to organize them into such a wondrous array goes when the moments have passed. Those who have not been close might dismiss the deathbed conversion of a scoundrel or the feeling of all-encompassing well-being that accompanies the final hand squeeze given in the last moments from a stranger on some battlefield, as an impulsive, last-ditch attempt to prepare for the unknown. Perhaps in some cases it is; I cannot speak for all who have passed within a few breaths of the other side. But my impression, my experience, is that the understanding of the process is more powerful than fear of the outcome. What I saw in hindsight after I passed through those moments was not that Eric had saved my life, it was simply that, by miracle or pure chance, he had been there exactly when I needed him to be. And for that, I now christen him the Angel of the Orient. I love this, it's a great tale of endurance through a series of hardships.. I once had an adventure full of mishaps myself. The relationship between you and "the Angel" is quite touching and educating as well. Thanks for the post. Thanks, Liz! This was definitely an incident that helped shape my outlook on life.